Last time, we had looked at the most basic communication which can be achieved among activities. It allowed us to switch between activities back and forth, which is an important concept used in almost all the android apps these days. Moving on, it’s time to look at the data transfer using Intents. Consider the case of a simple Task application, in which a To-do list is shown in one activity while another activity performs the task of adding new items to the list. So, what’s happening here? Basically, we need to create a new task in the second Activity and somehow transfer it to the first activity so that it could add it in the existing list. Note that we are not using any database. If we do so which is done most of the times, this app will be useless in itself. But, I am still discussing this app because I feel that it’s the best in order to understand the concept of transfer of data which you may need in various other apps. In this post, I will not go through the layout or the entire code of the app. I may go through it later. But, I hope that you will be able to do so after going through the previous posts. As a hint, we will be using a TextView (to display the list) and a Button while making the first activity, while the second Activity will have an EditText and a Button. Assuming that we have an EditText in the second Activity and when the user presses enter, the string in the EditText is captured in a string variable called NewTask, we need to simply tranfer the contents of NewTask to the first activity. 1 as a parameter acts as a unique code used to distinguish data received by this intent from the data received by other intents if more intents are used. Using the above functin, we have been able to call the intent, but we have not yet accessed the data which comes back with this intent. In our case, requestCode is 1. resultCode is a variable which is set to value RESULT_OK if the intent was successfully handled. data is the variable which contains the data received from the other activity. In the next post, we will look at the code to extract the information as well as the code for the second Activity which puts the information in the intent. This entry was posted in Intent (Android) and tagged Intent. Sorry for the delay in the post this time! Let’s go ahead! In the last post, I gave an overview of something called Intents in Android. If you have not gone through it, please refer to Communication between Activities using Intents! first and then, come back here! This time, I am going to discuss the simplest app which can demonstrate the use of Intents. Even though, the app in itself is of no use but, concepts discussed during its development will help us in our future endeavors. I will be building on our previous HelloWorld App which (till now) simply shows a Toast when we touch a button on the screen. First of all, we will be needing two activities in our project which will be communicating with one another. So, simply go to the project folder in the HelloWorldApp that we have been developing upon, right click, select New and the, click on Class. Fill the fields as per the following figure and select Finish. A new activity called SecondActivity.java has been created. But, you will see that there is no onCreate function. Just copy the code from below. It will be exactly the same as the one automatically generated when you create a new project and hence, you don’t need to remember it. Note the change in the value of the parameter of setContentView. Yes, it refer to a new layout file called second.xml. Simply make a new file called second.xml in the layout folder and copy the contents from main.xml to this file as we want the similar layout for this activity too. To create the new xml file, simply right click on the layout folder and select New->File. Name the file as second.xml and select Finish. Remember to give a different ID to the button of second.xml to avoid conflicts. Just change the value of android:id attribute of Button tag to something that was not used for main.xml. Let me change it to button2. Also, change the text of this button so that we could distinguish between the two activites. Now, we need to play with the onClick Listeners of the two buttons (present in the two activities) to start the communication. In this app, we simply want to switch between the activites when the button is pressed. 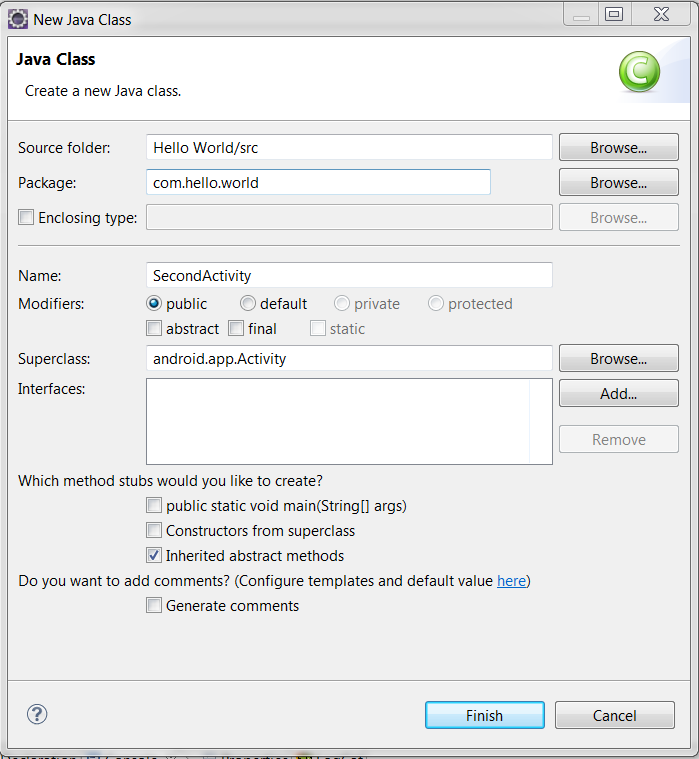 When we click the button on HelloWorldActivity.java (Default Activity of our app), we want to switch to SecondActivity.java and when we click the button on SecondActivity.java, we want to return to HelloWorldActivity.java. Try to search and write the code for the same yourself based on our discussion in the previous post. In the next post, I will discuss it and some more concepts in the Android app development. This entry was posted in Intent (Android) and tagged Activity, Intent. So, we have completed the development of our first app and it’s time to move on! This time, we will ponder upon the question, “How to communicate between activities?”, i.e., Is it possible to switch from one activity to another in an app and if so, how? This post will try to answer most of these questions? Let’s start from the very basic question! Why do we need to switch between activities? In an app, we need to have multiple activities which perform various tasks. As an example, a Message application has at least an Activity for showing the entire list of threads and an activity for creating new messages. Hence, we need to switch between these activities over and over again in order to make a user-friendly Message application. Similar situation arises in most of the apps since most of them consist of more than one activity. So, we can see that we need to switch between activities, and most of the apps consist of various activities which can switch between one another. Now, we need to see how it is possible. Clearly, the title of the post suggest that there is something called Intents in an Android App which can help us in this regard. Intent is the part of the Android framework which facilitates communication between activities. An intent can be treated as a function which can be called in an Activity with the parameters which (in broad sense) give the location of the activity to which we need to switch over. One can use intents to not only switch between activities, but also to share some data from one activity to another. We will talk about it in detail later. Once an intent is called, the control switches over to the other activity. The other activity after completing its job can simply call a function finish() in order to finish the activity and pass the control to the earlier activity. When the control is sent back to the earlier activity, a specific function (called a callback function) is executed which can be used to process the data sent by the other activity (if any!). So, we have discussed the complete flow of control with the use of Intents! In the next post, we will start the development of the second app based on intents where we will look at the exact code. This entry was posted in Intent (Android) and tagged Callback, Intent.